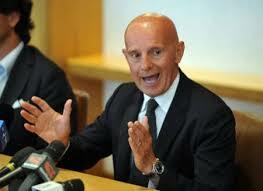 The Italianist is suddenly awaken from a year-long slumber by the recent statements of Arrigo Sacchi. Sacchi was the coach of, among others, A.C. Milan football club in the 90s, when the Milanese team was practically undefeatable. He also led Italy through to the final of the 1994 FIFA World Cup in the US, sadly lost to Brasil after a particularly uninspiring match (which ended like this). (However, someone has questioned whether the 1994 performance was the result of Sacchi’s coaching skills, or of mere luck). Sacchi is now under fire for some comments he made at the end of a tournament for young players in Viareggio, Italy. He denounced his malaise at seeing too many black players. He said: “I am not a racist. But there are too many foreigners! !” To prove that he was no racist, he added: “I have coached Rijkaard“. This is Rijkaard. Look how black he is!! Having clarified he is no racist, Sacchi then went on to explain that “it is a shame to see so many black players in our youth teams. We [the Italians] are a people with no dignity, nor pride for our own country”. A racist, moi? Posted in Ma che caz..? Hi Thanks for your comment – what’s amici d’Italia? TheItalianist on A racist, moi? amicilaurie on A racist, moi?